Some greyhounds withdrawn from National Coursing Meeting owing to “high contagious infection”! 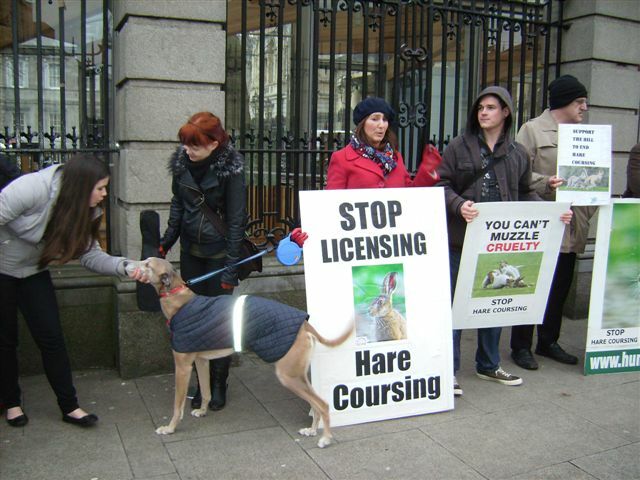 The spotlight among animal lovers will on the plight of the hares for the next three days (Saturday February 10th, 11th, and 12th) in Clonmel, Co. Tipperary, but spare a thought for the greyhounds. Several have already been withdrawn from the “National Coursing Meeting” due to outbreak of a highly contagious infection in kennels in four different counties. The animals have were found vomiting and suffering from diarrhoea. A vet confirmed it was an infection that could “spread like mad”. Some comments have appeared on internet greyhound chat forums like “Greyhound Nuts” but greyhound industry PR people are desperate to keep the whole thing quiet, lest panic spread on the eve of the big “showpiece” hare baiting session. It’s bad enough that greyhounds are treated so badly in this “industry”, with dogs being abandoned every week (dead or alive), doping widespread, and blooding on live bait an everyday occurrence...now we have this attempt to cover up what could be a major blow to the industry. Some greyhound owners will be discussing the infection in the Minella Hotel tonight, according to a prominent greyhound trainer who posted a message online. A better approach is: Call off the whole 3 day cruelty fest in Clonmel. If they don’t care about the hares, they should at least look after the dogs they claim to cherish and love!